Fundraiser for Louise Vincent by Jess Tilley : Help Louise walk again!! Hello harm reduction family, friends and allies. As many of you know, I have worked closely with Louise on a plethora of projects and continue to build a strong team based feminist led model together that has made the bond between us unlike any other I have ever experienced in my life. She is truly a warrior and refuses to let me give up on myself when all seems bleak and dismal. She always puts others first, speaks for those who cannot speak for themselves and is a hero to the unloved, the undesirables and the forgotten. When there is bad drug policy, you can bet Louise ( and myself!) will be there fighting against it. She often goes without pay to ensure her employees are compensated. As many of you are aware, Louise lost her daughter, Selena, a few years back to an overdose. Soon after, she had her leg amputated as a result of being the survivor of a vehicular hit and run. She recieved biased medical care due to the fact that she was a PWID. I cannot begin to fathom this severe level of loss but somehow Louise managed to move forward, all the while helping our community in a myriad of ways. She also opened the first ever legal peer run syringe service program in North Carolina, subsisting on a shoestring budget, often using her own money to keep the program afloat. This past May, Louise developed an infection in her leg which required a second amputation. The first was below the knee and it took her nearly six months to learn how to walk with her prosthetic leg. Now she has to repeat the grueling process. But this time the amputation was above the knee, requiring a much more sophisticated prosthetic leg. On Selena's birthday, October 25th, Louise received the call she had been patiently waiting for...her leg was ready! When she went to pick it up, however, she was told she needed 20,000.00 up front. This, combined with it being her daughter's birthday, sent her into the depths of despair. I want desperately to get her leg for her and to allow her the freedom to move about once more. As a woman who has experienced violence, Louise feels exceptionally vulnerable in her present state. I have seen her struggle without complaint to do what most of us take for granted every damn day...to walk. The amount of exertion it takes her to complete simple tasks is astounding and I so proud of her for not giving up. She has helped so many and it is time we help her. I refuse to let this minor hiccup beat her. I love Louise like family and have seen how the loss of her leg truly affects her in private. She puts on a brave face but she deserves to be truly happy and to feel whole again. No matter how many times I tell her she is beautiful, I honestly do not think she will feel the same until she has her leg. this is a hardship for me as I do not make a wage that can support my basic needs. It is an Ottobock Microprocessor leg with a knee which will allow me to walk and continue to do the work I love. I thought one amputation was enough for a lifetime, but two was more than I could stand. The way we treat people who use drugs in this world affects every part of our medical care and living. I know for a fact that my health and health care would be different if doctors saw me as a person instead of someone who does not care about my health..."
Please help us get Louise her leg. She still has a long road ahead of her and will have to spend months learning to walk again. Please help her take her life back and not leave her at the mercy of others and confined to crutches or a chair. I see how it hurts her soul when cruel individuals stare and comment. I fear she can only take so much more of this daily struggle. Together we can give her back the ability to be her true self again and continue doing the work that sustains her. UPDATE: Louise was able to set up a payment plan because of your help!! Hanger took a downpayment and she will now pay $1000.00 per month so any help is so appreciated. That will be a rough bill to pay so thank you for all of your generous gifts. It means the world to Louise, her family and her friends. 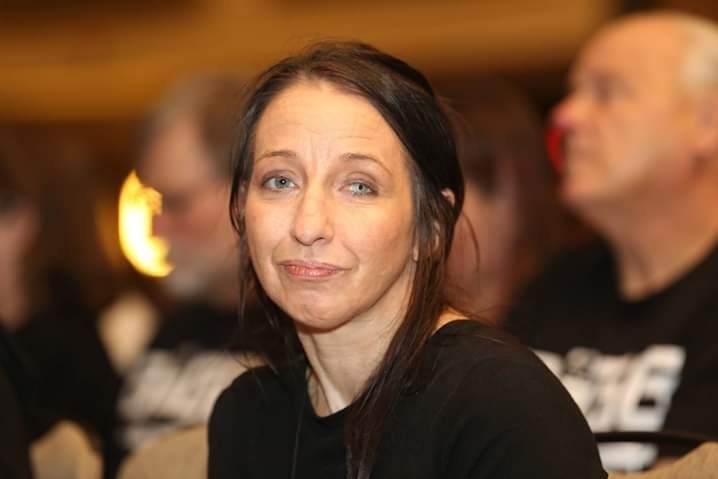 Many of you know Louise Vincent as a passionate harm reduction advocate and Director of the Urban Survivors Union (USU, Piedmont Branch), a drug user union in North Carolina. USU runs the longest operating needle exchange in the American South and her and her team work tirelessly to improve health outcomes and quality of life for people who use drugs in North Carolina. What many of you don’t know is that, 2 years ago, Louise was the victim of a hit-and-run car accident that left her leg debilitated. She ultimately lost her leg to amputation. There is strong evidence to suggest, however, that amputation was avoidable because the systemic infection that ensued may have resulted from medical negligence and treatment mismanagement. The scientific literature on stigma surrounding people with SUDs shows that moral judgement by medical staff can influence professional judgements and clinical assessments and contribute to the uneven distribution of medical care and treatment. This form of stigma was on full display at every point in Louise’s continuum of care. Discrimination based on her stating that she had a SUD and was on methadone clearly influenced how medical staff engaged with Louise; we believe it’s to blame for the substandard and delayed care she received for what was an acute and treatable injury. The combination of substandard care and institutional (i.e., medical) stigma contributed to a protracted treatment response by medical staff. The long and unnecessary time period from clinical assessment to treatment administration provided ample time for the infection to advance and spread, eventually becoming too far along to save her leg below the knee. As a result, Louise had her right leg amputated in May of 2017. This past May (2018), a year from the initial amputation, Louise developed another infection in her leg that required a second amputation. 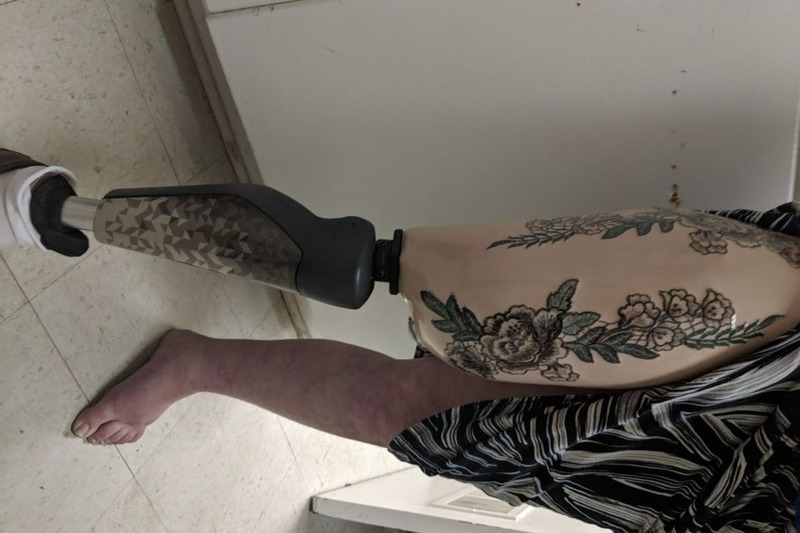 The first amputation involved saving the knee and required six months of intense physical therapy to learn how to walk with a prosthetic leg attached below the knee. And now she has to repeat the same grueling process but with a more sophisticated prosthesis, one that incorporates a knee mechanism within the leg itself. Because the prosthetic needs to be built for Louise’s specific physiological and physical requirements, she was uncertain when she’d be able to walk again, and USU, in turn, was uncertain about when their Director would return. On October 25th, Louise finally received the call she’d been anxiously waiting for: her leg prosthesis was ready! But this joy was short-lived. She was told that insurance has a $20,000 co-pay (yes, twenty-thousand!) and that it needed to be paid before she could pick up her leg. Although she would never admit it, the news that the co-pay was astronomically high sent her into heightened depths of despair. We cannot begin to fathom the severe and repetitive level of loss that Louise has experienced, but she somehow manages to always move forward, all while continuing to help her/our community and without interrupting the level of overdose prevention trainings that USU delivers to all North Carolinians. Both of us have worked closely with Louise. Most recently, Jess and Louise developed a collaborative, feminist-led harm reduction service model that they’ve been delivering around the country to women of childbearing age who use drugs. Jess describes her and Louise’s relationship around this work like no other she’s ever had the privilege to be part. The goal of empowering women to free themselves of oppressive or controlling relationships to take (back) control of their health is needed now more than ever given that drug overdose is the leading cause of mortality for women of childbearing age. 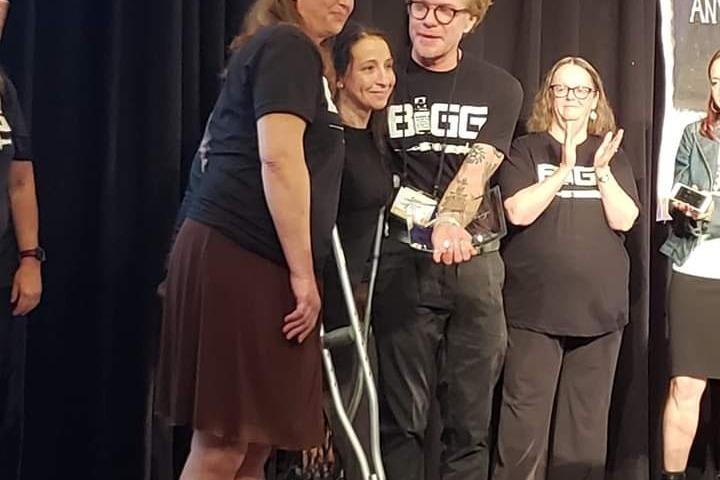 Louise is a true harm reduction warrior and a person who refuses to quit even in the face of unprecedented levels of death and despair—much of which has directly affected her close friends and immediate kin—and when all effort seems bleak and dismal. She always puts others’ health and well-being before her own; she speaks for those who cannot speak for themselves; and she’s a hero to the unloved, the undesirable, and the forgotten—that is, our people! When reactionary and racist drug policies are being deliberated or administered, you can bet Louise will be there fighting against them. Indeed, she often works without paying herself so as to ensure her employees receive stipends to attend meetings and events and so the delivery peer-based services can go on unabated. The amount of energy and exertion that it takes her to complete mundane tasks is astounding and we’re so proud of her for not giving up. She’s helped so many of us and now it’s time we help her. We refuse to let a for-profit health care system and exorbitantly high co-pays beat her. We love Louise like kin and we’ve both seen how losing a leg has affected her. She always wears a brave and happy face but she deserves to be truly happy and to feel whole again. No matter how many times we tell her how beautiful she is, we both know how she will feel until she has her leg back. "I thought one amputation was enough for a lifetime, but two was more than I could stand. The way we treat people who use drugs in this world affects every part of our medical care and living. I know for a fact that my health and health care would be different if doctors saw me as a person instead of someone who is seen as not caring about my health." We desperately want Louise to get her leg. We want her to have the freedom to move about once more. Please help us achieve this goal. Louise still has a long road ahead of her and she’ll have to spend several months learning to walk again. By donating to the co-pay, you can help her take her life back without placing her at the mercy of creditors or confined to crutches or a wheelchair. Like the ethos of harm reduction, let’s all work together to give Louise the ability to be her true self and continue doing the work that sustains her and USU’s goal of increasing health outcomes and resiliency for our communities. We just want to take a moment and thank all of the amazing individuals who donated so far. Louise feels so loved!